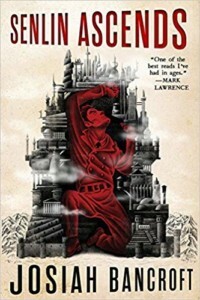 Writing is a grueling task, but this unique fantasy novel feels as if it sprang whole from the authors head. Senlin is a young schoolteacher from a backwater town who becomes separated from his wife on their honeymoon. Their destination is the immense and unknowably tall Tower of Babel. At first. the cutthroat cultures of the tower seem to digest Senlin and excrete him, but he rises to the challenge of pursuing his equally-resourceful wife through the floors (or “ringdoms”) of the tower, making satisfying enemies and a useful friends in the process. The writing is clear, evocative, and intelligent. This is a top-notch character-driven fantasy novel.